Innovation is the life blood of practically every organization. Innovation drives growth, development, and prosperity for many organizations and geographical areas. Sometimes, innovation thrives within a certain geographical location or in certain organizations that are known for their innovative approaches. 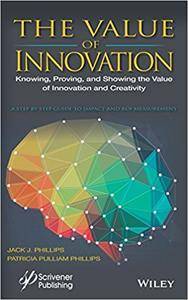 This outstanding new volume will demonstrate how to measure the success of innovation in all types of organizations. In the last decade, there have been tremendous investments in creativity and innovations sponsored by companies, cities, states, countries, universities, NGO’s, and even non-profits. With the magnitude of emphasis on creativity and innovation, the sponsors and key stakeholders will demand to know the value of these programs. The Value of Innovation: Measuring the Impact and ROI in Creativity and Innovation Programs will show step-by-step how to measure the impact and the ROI of innovation and creativity programs. The process collects six types of data: reaction, learning, application, impact, ROI, and intangibles. Data are collected analyzed and reported using a systematic, logic model. Conservative standards create results that are both CEO and CFO friendly. This proven process has been used now in 5000 organizations and this new book adapts the method directly to this critical area of innovation, showing examples and case studies. Feel Free to contact me for book requests, informations or feedbacks.